BOULDER — Peg Romano is all about design. The co-owner of Boulder’s Mediterranean Restaurant — locally known as “The Med” — and Brasserie Ten Ten across the street, had designs on a new space to add an upscale Italian eatery. Once she found that site, she designed the interior as well as the seasonal comfort food. 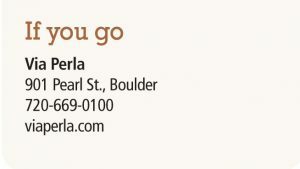 Now, two and a half years after its March 2016 opening, Via Perla bustles with downtown Boulder crowds enjoying an ever-changing menu of Italian fare from different regions and different seasons. “It was a concept from start to finish,” she said. She and her husband “started with The Med 25 years ago” in partnership with longtime Boulder restaurateur Anthony Laudisio, “and that was the beginning of restaurant design for me,” Romano said. “We remodeled the space that was there and have done two more remodels since then.” Then, 15 years ago at Brasserie Ten Ten, “in order to get a whole new feel and look, we decided to make it look like a brasserie,” a type of vibrant, informal dining venue common in France. For their Italian restaurant, the Romanos closed in summer 2015 on the $2.1 million purchase of the ground-floor space of a newly constructed building at Ninth and Pearl streets that was built on the former site of a Tesla Motors showroom and Marisol Imports. Diners entering Via Perla immediately notice a contrast — the darker, cozy bar area straight ahead, the work of woodworker Howard Palmer, and the bright, contemporary dining area and covered patio to the left. The 3,800-square-foot bar and restaurant seats a total of 160 customers and employs about 60. “There’s a wood ceiling in bar, giving it sort of a farmhouse look from Italy,” she said. “The rest of the dining room is white and a little more modern. We wanted to kind of blend the two. A lighted, glassed-in cooler displaying rows of wine bottles from floor to ceiling is a conversation piece near the front door. 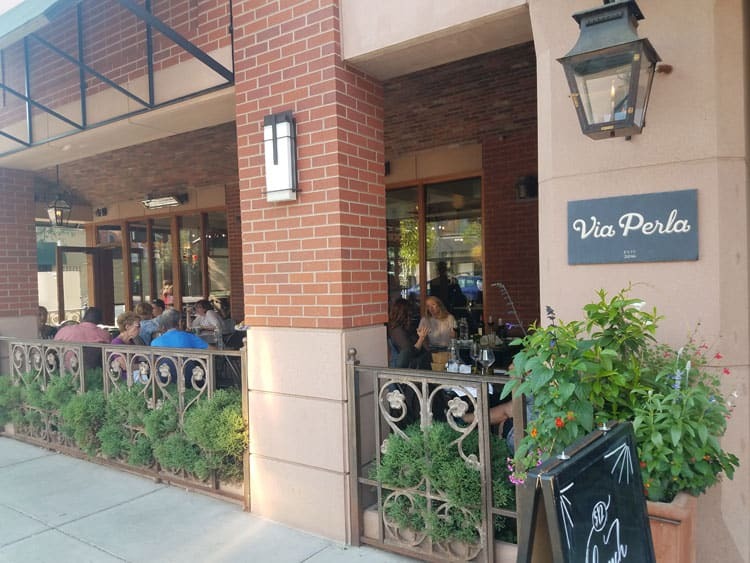 The fare at Via Perla requires “a lighter hand than American Italian,” she said — “less garlic, sauces are a little lighter and not as much. 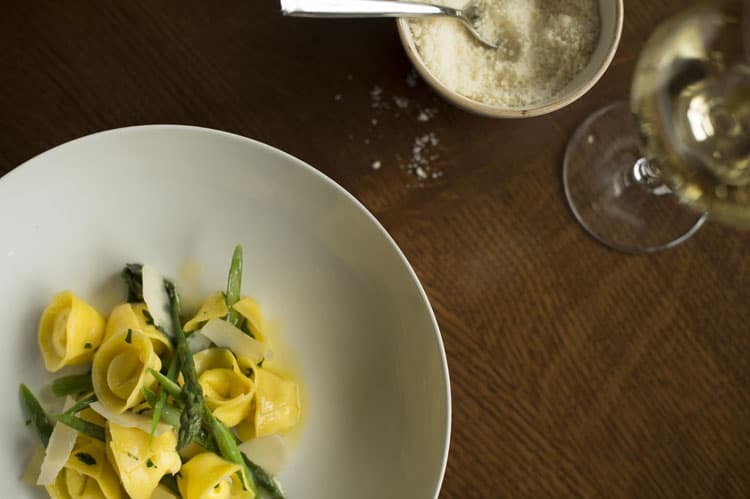 For Italians, it’s about the pasta.” And Via Perla makes about 80 percent of its pasta in house. “I feel like everybody in the world has their idea of what an Italian restaurant is,” Romano said. “I feel like you have to pick your genre and stick with it. We basically didn’t pick a region; the food is very different in Rome than in Tuscany, and different along the coast. “So our genre is really quite seasonal, in the style of the Italian way of eating things. We cook as seasonally as possible. We’re just trying to showcase a little bit of Italy in different areas and then change things as the season goes. Heffel just added a halibut item and changed the chicken Marsala, she said. She takes pride in the wines and olive oils she imports from small producers, as well as “some really great cheeses” including a buffalo mozzarella “that Italians are crazy about” and parmesan reggiano on “big, giant wheels.” Then there’s the prosciutto, the thinly sliced, dry-cured ham that “you really can’t have an Italian restaurant without,” she said. When the Romanos bought the new space from 901 Eldridge Inc., a group of investors led by Deneuve Construction owner Phil Shull, a BizWest article quoted Greg Topel, director of operations at Walnut Restaurant Group, as saying Peg Romano has other restaurant concepts in mind for Boulder.